On Friday afternoon we went on a field trip for my Ecology course to the beautiful Winterton Dunes NNR on the NE Norfolk coast to learn about dune systems and practice transect surveys, including designing and carrying out our own mini project. Winterton Dunes, as the name suggests, is an extensive acidic dune system that boasts an impressive succession of habitats from the open, shingle beach through the embryo and fixed dunes, to the acidic dune heathland and low-lying wet 'slacks' between the dunes. Due to the range of habitats there, Winterton is home to a wide variety of species, including the UK's largest colony of Little Terns Sternula albifrons (c.300 pairs) and some that are more specialist e.g. sand wasps, Natterjack Toads Bufo calamita, Grayling butterflies Hipparchia semele and Downy Birch Betula pubescens. Winterton Dunes itself is designated as a National Nature Reserve (NNR), but about 50% of it also sits within the Norfolk Coast Area of Natural Beauty (AONB) and it is also part of the Winterton-Horsey Dunes Special Area of Conservation (SAC). The priority feature for the areas' SAC designation is the Atlantic decalcified fixed dunes that are present, as this is the only example of acidic dune heath and its associated acidic grassland anywhere on the east coast of England. This is in contrast to the majority of north Norfolk's coastline, which are mainly calcareous, species-rich dunes. Our visit to Winterton was split into two main parts: an initial rapid transect assessment moving from the beach inland, over the embyro dunes, fixed dunes and their slacks and onto the acidic heath; we also designed and carried out our own mini project to assess the impact of trampling from visitors on the lichen abundance and distribution along footpaths. For the initial assessment, we were investigating how the number of plant species, maximum plant height and plant abundance and changed over a transect that started on the beach and moved inland over the dunes. Moving an equal distance each time, we placed 50x50cm quadrats randomly, each time counting the number of species, the height of the tallest plant within the quadrat and the estimated the amount of bare ground to give an idea of plant cover. Figure 1. 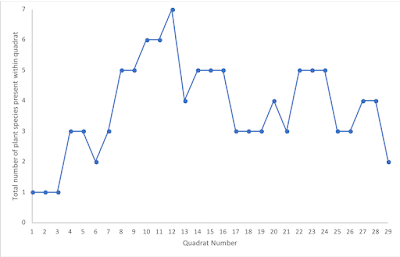 Change in the total number of plant species within each quadrat. Quadrat 1 was located on the beach at the foot of the embryo dunes, and successive quadrats were located an equal distance apart, moving inland from the beach. 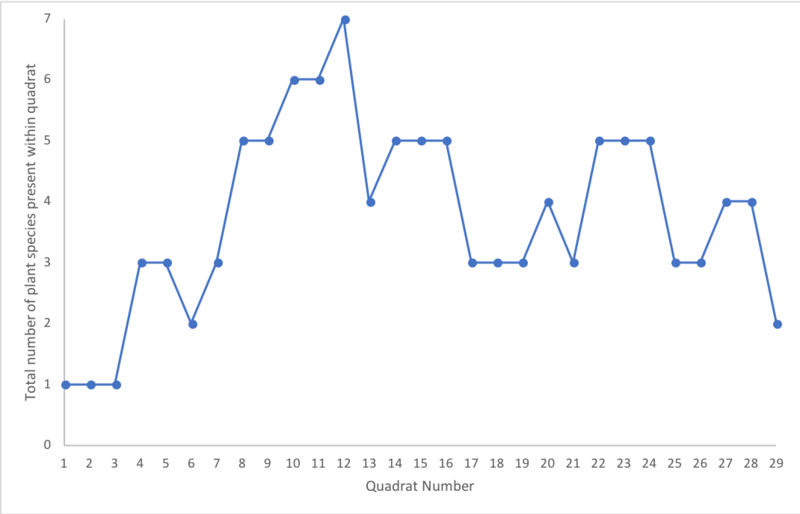 The maximum number of species (7) was recorded in quadrat 12, however there is quite wide variation over the course of the transect. Initially there was just 1 species recorded, Marram Grass, which is adapted to be a salt and wind tolerant plant. Moving inland, species richness increased due to the more stable conditions created by the pioneer Marram Grass; its roots help bind the sand together and trap moisture. When it dies and decays, the nutrients are returned to the soil, all in all, creating a more hospitable environment for other species of plant. As you move inland, not only does the substrate become more appropriate for a wider range of species, but the fixed dunes also provide shelter from the wind and the sea spray, which allows plants that are not salt tolerant to grow. Figure 2. 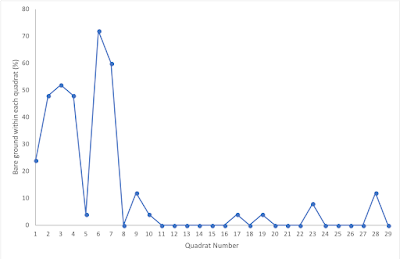 Change in the maximum plant height within each quadrat, moving an equal distance inland between each quadrat starting from quadrat 1 which was placed at the foot of the embryo dunes. 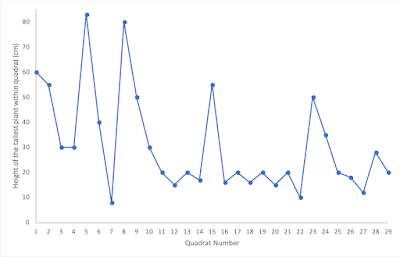 Generally speaking, the tallest plants were found in quadrats located nearer the coast compared to those further inland and there is a plausible explanation for the pattern shown in Figure 2. Marram Grass is the dominant species on the beach and embryo dunes and can grow up to 1.2m in some cases. Therefore, as it is one of the only species present in the initial quadrats, it is able to grow tall, however as you move inland and the soil becomes more accessible to other plant species, there is more competition for space and resources, so individual plants are probably unlikely to be able to grow very tall. Also, as you move inland, the dominant plant species changes to Sea Spurge Euphorbia paralias and Red Fescue Festuca rubra. There are a few quadrats that buck the general trend of decreased maximum plant height with distance inland, however these are likely to be quadrats that happened to include a Gorse Ulex europaeus bush as we moved inland towards the grey dunes. Figure 3. 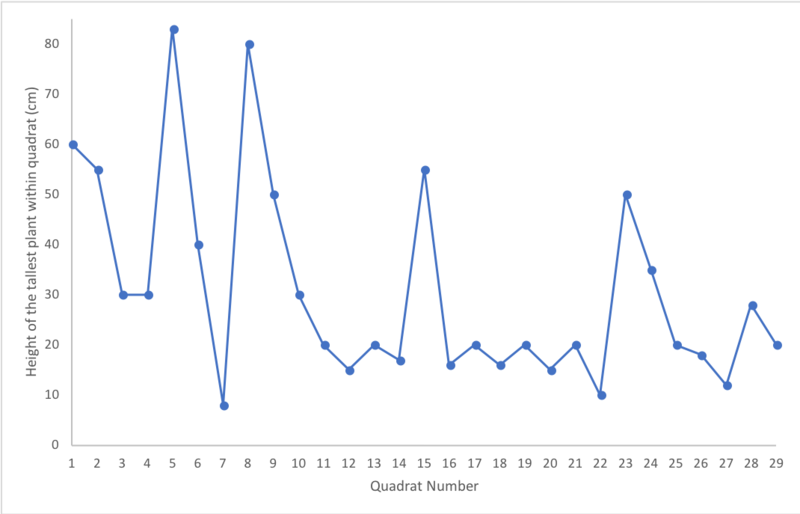 Change in the percentage of bare ground within each quadrat, moving inland. 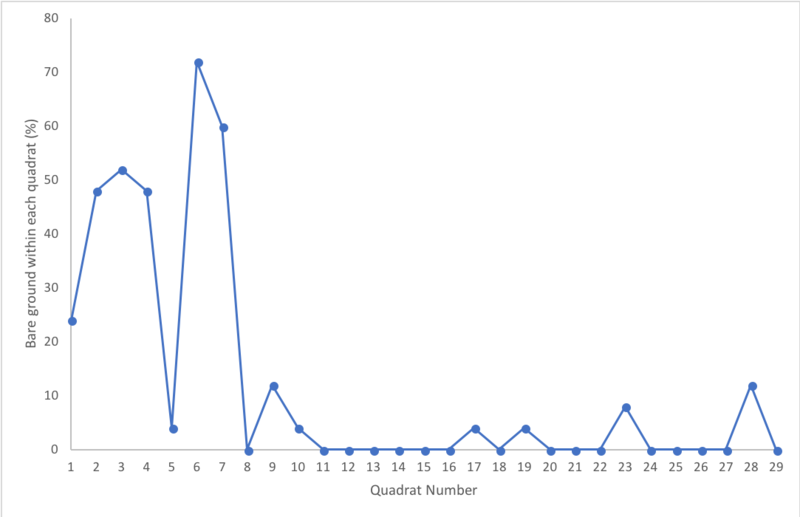 Figure 3 shows that the amount of bare ground is greatest within the first 7 quadrats (excepting quadrat 5). This is probably because of the low species diversity on the embryo dunes and at the beginning of the fixed dunes. Moving inland, there is a greater species richness, and lichens because much more abundant on the grey dunes, helping to cover most of the ground within each quadrat. For the second part of our visit to Winterton, we were split into small groups and had to design and implement a study to assess the impact of trampling on lichen abundance along a footpath. Lichens are important bioindicators for a range of environmental factors, including air quality and soil pH. Our group decided to place a 50x50cm quadrat in the centre of a well-defined path and count the number of squares within our quadrat that contained lichen. We repeated this at 1m intervals for 3m on both sides of the path, starting from the same centre point each time. We also moved along the path at 1.5m intervals, which we repeated 10 times. Overall we counted the lichen cover in 70 quadrats. Figure 4. The mean percentage cover of lichen at quadrats situated in the middle as well as 3m, 2m and 1m left and right of the path, from the middle. 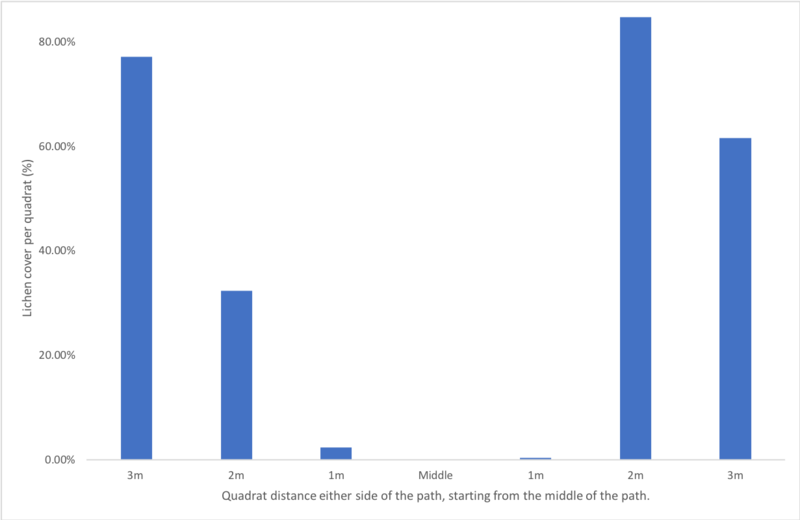 Figure 4 clearly showed the lack of any lichen in the middle of the path and very little up to 1m either side as well. 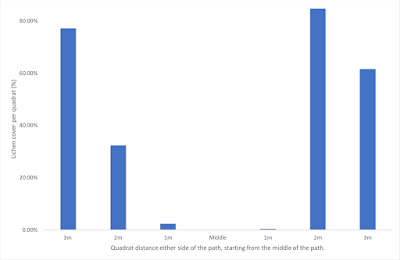 Average lichen abundance was much greater 2-3m from the middle of the path, showing the extreme effect that trampling from visitors has on lichen abundance and distribution. Due to the significant number of paths throughout the dune system at Winterton, as well as the fact that the paths vary in size, with some up to 2m wide, it is clear that trampling has a large-scale impact on lichens on this site. If we'd had more time, it would have been good to carry out the same methodology on a number of paths around the Winterton dune system in order to make the results more representative of the whole site and to see whether the effects of trampling were evenly distributed, or whether some parts of the site suffered from trampling more than others. To reduce the impacts of trampling on lichens, the number of paths throughout the dunes could be restricted and visitors encouraged to use 'main' paths instead of many smaller ones. Also, it could be possible to have information displays around the site to highlight the sensitivity of the area to human disturbance, or some sort of exclusion zones could be created in order to prevent any sort of human-inflicted damage to key areas of the dune system. 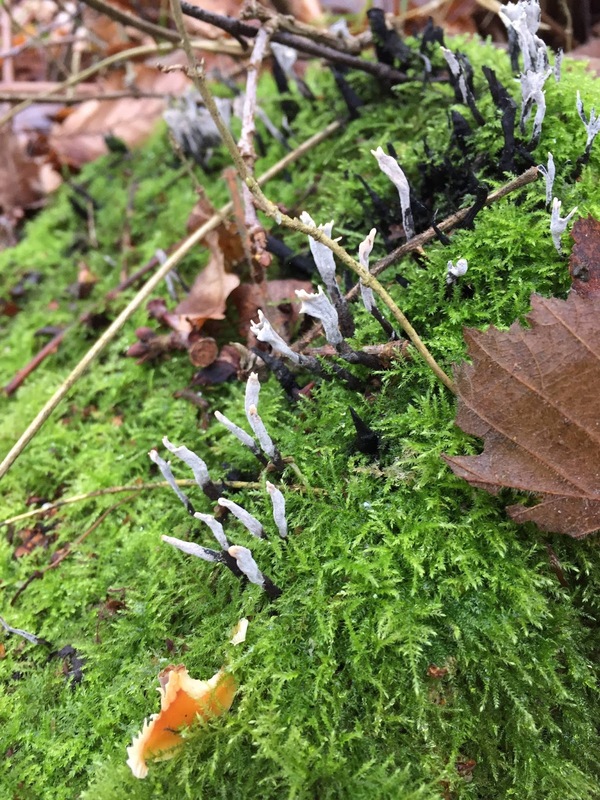 Xylaria hypoxylon, or Candlesnuff fungus if you don't fancy trying to pronounce the scientific name, is a very widespread and common fungus in the UK and throughout mainland Europe, as well as in many parts of North America. It can be found all year round, but is particularly noticeable during late autumn and winter and is normally found on the dead wood of broad-leaved trees, and more rarely on coniferous trees. Candlesnuff fungus is usually one of the last fungi to attack rotting wood, and is often preceded by other species, such as Honey Fungus (Armillaria mellea and co.) and Sulphur Tuft (Hypholoma fasciculare). the ascospores (spores uniques to the ascomycetes fungi) ripen. 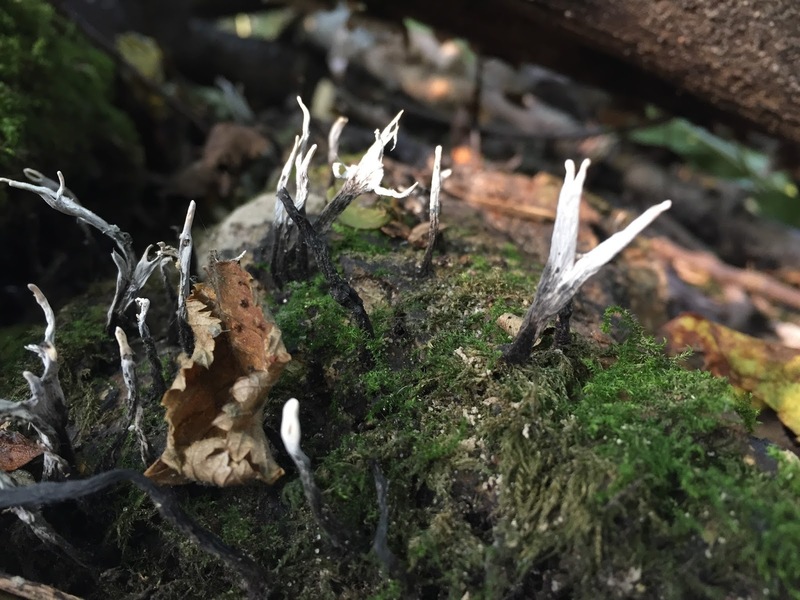 The fruiting body of Candlesnuff is between 3-5cm in height and some are simple spikes, but most tend to branch like antlers. They are black and velvety below, and whitish towards the tip and are usually found in clusters. 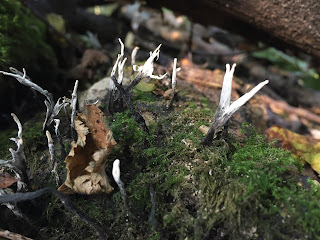 The binomial name is derived from the fungi's habits, with the genus name Xylaria coming from a Greek noun that means wood and the species hypoxylon coming from hypo- which means beneath (or less than), and -xylon, also meaning wood. Surprisingly (to me anyway! 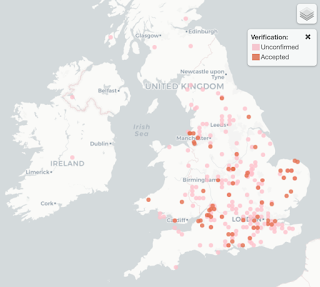 ), there are a number of bioluminescent fungi in the UK, with Candlesnuff being one of them. The phosphorous that accumulates within the mycelium (the vegetative part of the fungus consisting of a mass of branching hyphae) reacts with oxygen and other chemicals within the fungus to emit a continual light. Unfortunately the bioluminescence is very weak so you can only see it in really dark conditions or using an image intensifier or by taking a long exposure photograph in a pitch black room. 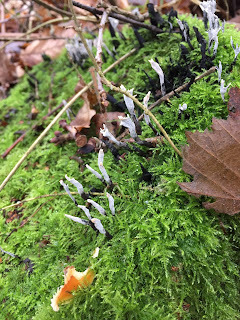 Candlesnuff Fungus (Xylaria hypoxylon) on rotting wood in NE Hampshire. Velvet Shield (Pluteus umbrosus) is a fungus in the class Agaricomycetes. 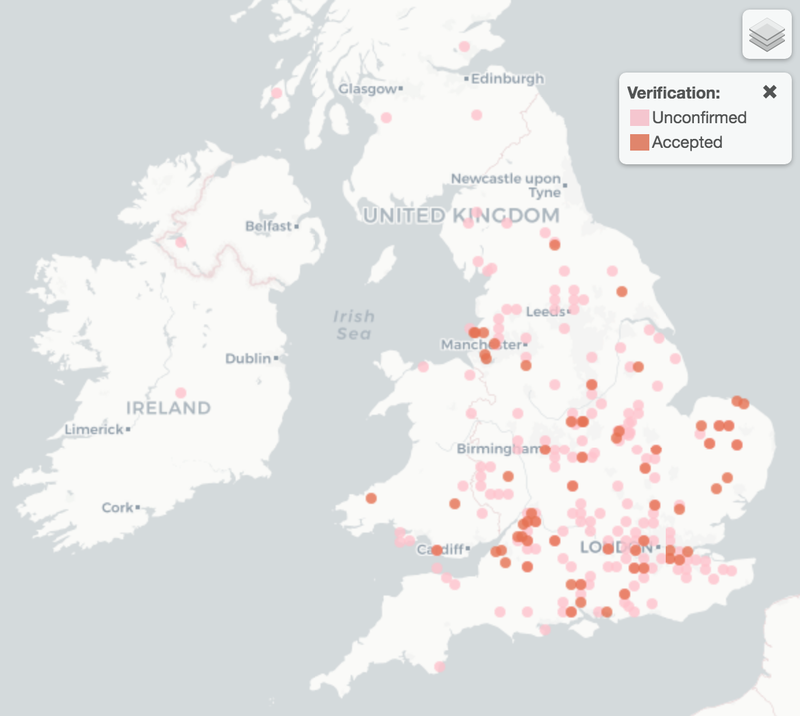 It can be found throughout late summer and autumn, and although it is widespread throughout the UK, it is fairly rare. It is also found throughout much of northern and central mainland Europe, and has also been recorded in North America. Inhabiting the rotting fallen branches and other woody debris of broadleaf trees, this species is either found alone or in small groups. Its radially wrinkled cap and pale pink gills make it distinctive. The cap is 3-9cm in diameter, mid brown colour - darkest towards the centre and usually with quite irregular marks aligned radially. The stem is 3-8cm long and 5-12mm in diameter along its whole length and rather pale in colour. Underneath the cap, the gills are white at first, before turning pale pink with distinctive dark brown edges. deadwood on the UEA campus. 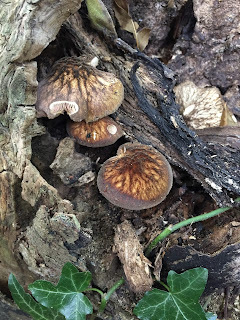 In a German study investigating the long-term effects of logging intensity on a number of different taxonomic groups, Pluteus umbrosus was one of 36 species of wood fungi that was used as an indicator of pristine conditions. 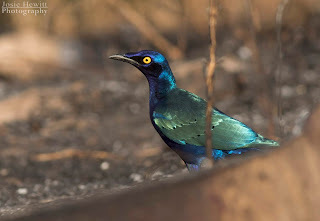 This is due to its requirements for rotting wood which is generally found more abundantly in pristine woodlands, compared to logged areas as logged/fallen wood is often removed from the site. 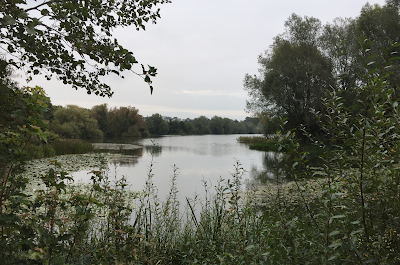 Well, since it's been almost 9 months since my last blog post, I figured it was about time I got round to writing an update... 2017 has so far seen me complete my A Levels via distance learning...an 'interesting' experience, and begin studying BSc Ecology at the University of East Anglia. 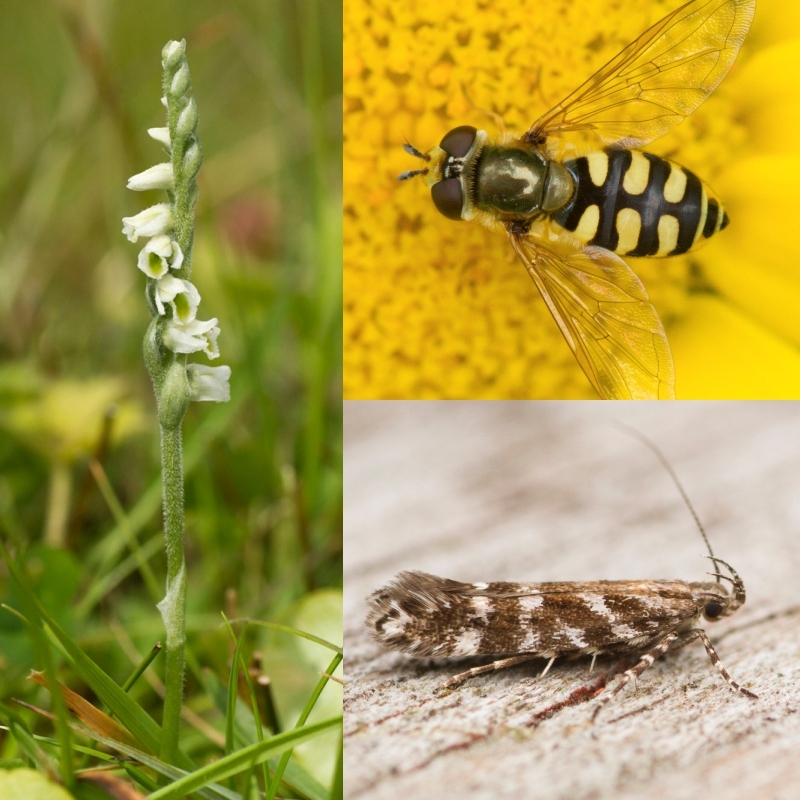 In the last few months I have also been trying to broaden my natural history knowledge away from just birds, so I have been doing a lot of moth trapping, started trying to ID hover flies and have also begun delving into the botanical world too... it's slow progress but at least it's a start! Getting much more involved in Pan-species Listing has really helped drive my curiosity and interest in the lesser-known taxa, as every species is equal when it comes to PSL. I would really urge any aspiring naturalist to sign up and start delving into taxa outside of your comfort zone... the sheer variety of wildlife on your doorstep will no doubt amaze you! 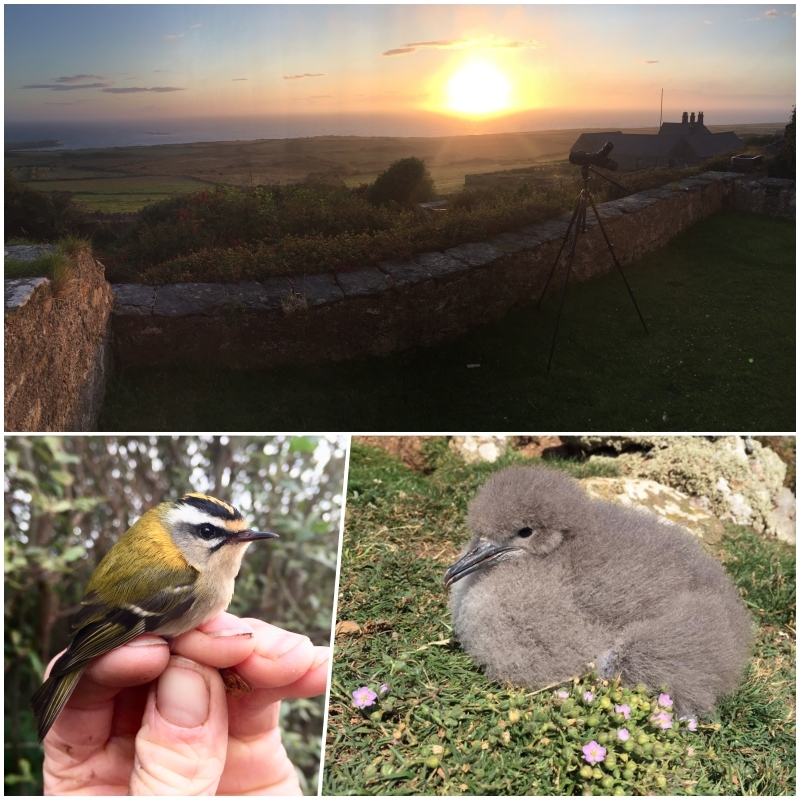 Over August and September I was fortunate enough to spend five weeks volunteering with the Bardsey Island Bird Observatory. Throughout my five weeks there I assisted with a wide variety of tasks, from the organised chaos of changeover days, to helping check Manx Shearwater productivity burrows, and co-leading the annual Next Generation Birders week. It was a thoroughly enjoyable experience and was brilliant to get an insight into the huge array of daily tasks that enable the Bird Observatory's high standards to be maintained. My thanks must go to Steve Stansfield (Warden), Emma Stansfield (Steve's wife), Ephraim Perfect (Assistant Warden), Liam Curson (Assistant Warden) and many others for having me, and for making my time on the Island so memorable. As part of my Ecology course I am required to keep an Electronic Journal, with a weekly post about a new species I have encountered on campus. This means that there should be many more posts here over the coming weeks and months; I hope to get that off to a start in the next few days, once I've had a chance to spend some more time wandering around the greener areas of the UEA Campus.